Protect your family from harmful EMFs! Measure the EMF (Electro magnetic Field) strength of every electrical device in your home, workplace or school; outdoor power lines, underground lines and even when you travel and shop for appliances. Health concerns about the negative effects of ELECTRO MAGNETIC FIELDS (EMF) from appliances, power lines, and home wiring have caused the U.S. Government to issue a warning to use "Prudent Avoidance" to help reduce your exposure to this risk. Since EMFs are everywhere it may be impossible to totally avoid them. The Safe Range K-II EMF Meter can help you measure these potentially harmful fields and determine the safe range to help reduce exposure. It also helps you determine which appliances produce high level emissions. 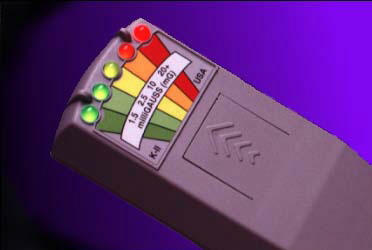 Ghost hunters, ghost whisperers & ghost busters use K2 meter / K-II meter / KII meter for ghost hunting & paranormal investigations.